Containing the 10 tracks making up "Segment 2" (Disc 2) of Summertime '06 - Gatefold Jacket. 2015 debut from the Long Beach, CA rapper best known as one-third of Cutthroat Boyz. 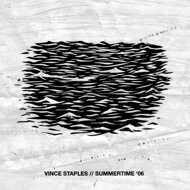 Summertime '06 is the follow-up to his 2014 EP Hell Can Wait. The album touches on events that happened in his life in the summer of 2006 at the age of 13 and onward. “Love will tear us apart. Nov 30th, 2005 was the beginning of the loss. The following summer multiplied it. Beaten paths, crowded with the hopeless. Same song every day, listening to the words of a dead man destroyed by his own mind and body. Why? Because at the end of the day we’re all dead anyway. At least where I come from. Love tore us all apart. Love for self, love for separation, love for the little we all had, love for each other, where we came from. Jabari, Chris, Shard, Tom, Richy, Tyson, Tony, Shelly, Phil, Marcel, Brandon, Steve, Jaron, Tay. Too many to name, too much to forget. Some lost to prison, some lost to Forest Lawn, some turned snitch. Some still here but it will never be the same. Bandanas, Stealing Levis and Nike Sb’s. Derringers and Sidekicks. Its crazy how little you notice and how greatly those things impact. Summer of 2006, the beginning of the end of everything I though I knew. Youth was stolen from my city that Summer and Im left alone to tell the story. This might not make sense but that's because none of it does, we're stuck. Love tore us all apart. Summertime ’06, June 30th.